Fate smiled on an unidentified young boy hawking on Alhaji Jamiu Sulaimon Street in Itele, Ota area of Ogun State on Tuesday evening as he was rescued from kidnappers in the area, just as he was about to be killed. No 3, Alhaji Jamiu Sulaimon, where the boy was rescued is unarguably one of the most beautiful houses on the street but no one could have imagined the horror discovered behind its high walls. When a Punch correspondent visited the scene on Wednesday morning, a police patrol vehicle was stationed in front of the compound to ward off curious residents and looters. Upon gaining access to the house, it did not take long for the correspondent to notice a spatter of blood on the walls of almost all the toilets in the house. One particular toilet had more heavy smears of blood on its walls and door. A resident of the street, Abdulateef Isa, told the Punch correspondent that the rescued boy used to hawk belts on the street. A police officer from the Itele Police Division said residents of the area came to the station to report on Tuesday evening that a boy who went into a compound to sell had gone missing. “Our divisional police officer instantly issued a search warrant and detached a team to the compound. When we got there, a large number of residents had gathered and we had to be strategic in controlling them for us to gain access. “But our DPO insisted that she perceived an odour that was abnormal. She asked one of us to climb through a window and check the corner of a toilet. And there was the boy, covered in blood. He was even too weak to shout. The boy was said to have been blinded in one eye as caked blood covered one of his eye sockets. There was a bloody deep gash on his neck also, which was suspected to have come from an attempt to slaughter him. The Punch correspondent learnt that the boy was immediately rushed to the hospital while the man found in the house was arrested. The agent in charge of the house was also later arrested. Few minutes after the police left the compound, the residents set the house ablaze and every valuable in the house was destroyed. A four-bedroom bungalow, painted in and out with fancy paint, it was clear the house was built by a wealthy person. Residents said the house was completed about three years ago. “The generator in this house runs all day long,” one resident said. “The men we see coming in and going out of the house keep to themselves. All we know is that so many people come into the house. Nobody has gone missing on this street before, so nobody had any reason to suspect anything,” Mr. Olusegun Adio, who lives a few houses down the street, said. 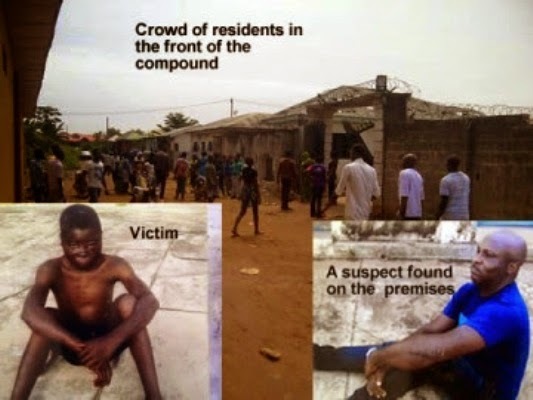 One of the leaders of the community, Alhaji Isa Jimoh, who notified the police about the missing boy, said he never had any inkling that kidnappers could be operating a den in the area. “I have no idea who owns that house and I have no idea when it was built. The short time it was built from start to finish, I was not around then. “When I got report that a child who was hawking and called inside the compound never came out, I had to inform the police because I realised it was not the duty of residents to storm the place. Jimoh said no one had ever been missing in the area, which was why they probably did not suspect any criminal activity in the house. Spokesperson for the Ogun State Police Command, Mr. Muyiwa Adejobi, said the suspects arrested in the case have been transferred to the Department of Criminal Investigation, Eleweran, Abeokuta. “Our men from the Itele Division moved in as soon as they got a report about the house suspected to be used by kidnappers and succeeded in rescuing the boy alive even though he was in bad shape. If not 4 God and his friend, d boy woulda bin history by now! God punish u evil pple! OMG I couldn't read again. What a wicked world. Hey what is really happening. Humans now see their kind like nothing. This is an evil act, imagine others that weren't this lucky to have emerged alive. Why burn the house? Will it bring the dead back or will it raise money to cure the boy? When will Nigerians learn that violence never pays?! Hmmmmm! Blood of God! De bera find dem............ Ndi ogun state tufia unu na rituals!!!!!!! Shuu! Dem doo unaa?????? Wow... thank God the police reacted quickly. If any more time was wasted heaven knows this story would have been a different one. The wickedness of some people in this world leaves one speechless. They shouldn't have razed the house ,now all the evidences are gone! The government should automatically give the death penalty to those involved in human trafficking for rituals. There needs to be a strong message sent that this kind of behaviour will not be accepted. It sickens me to see how people are preyed on for someone's sick fantasy. My God, you are faithful! To think that these people may still walk free angers me and makes me wish jungle justice had prevailed...I don't trust NPF one bit! Thank God he was rescued. Some people are worst than Bokoharam, if we complain, they'll complain more than us. God into ur hands I commit my family. Uhmm evil people everywhere, and this man might be someone husband or father o, ehn, what s going on in d country? Ritual killings everywhere, and this guy will go about walking freely and act like a normal person everywhere he goes, look at the face of a killer, may holt ghost destroy you and your lot. Pls. Police should also focus on who masterminded d razing of d building. Some of d socalled residents might have been part of the ritualists trying to cover up for d gang by destroying evidences. Could be a set up,because the house was burnt. The boy could have been planted,another possibility!......I know the extent people or cops can do to get rid of one . Anyway,I could still be wrong with my theory. Ppl are wicked oooo. Ah! Diaris God ooo. Hmmm. See how Nigerians are soiling our land with the blood of the innocent. Thank God the little boy is alive. Some people are desperately wicked. Burning the house makes very little sense...there goes all the evidence. This is horrible.. God save us!!! Thank God for the boy's frnd who noticed on time. Na bcus of dis kind thing God decided to punish nigeria with boko haram or even war in d country. Evil pple. U're a complete idiot. What's with being first to comment in a seroius issue as this? It's punishment for the wicked.......no matter how small,let d owner suefer some loss. Which eveidence for 9ja? D owner will simply bribe his way through and go back 2 his business. If u doubt, ask DSP,Bankole,Diezianni and co.
why burn the house?? ?up in smoke goes all the evidence! Chai! Man's inhumanity 2 man. His evil deeds hv found him out. Let him rot in jail. Rubbish! Professor caught abusing a female student in his office. Assuming your girlfriend made this great mistake in Public, what will you do? Whether the house is burnt down or not, nothing dey happen. Have we ever heard from the law enforcement agents what followed after the arrest of such dare-devil ritual killers? The answer is NEVER, EVER!!!! All we can say is thank God for the boy's life. All it takes is that the ritual killing squad will relocate and continue business as usual somewhere else. Most likely the main contractors are NEVER apprehended while the foot-soldiers are either released or left to their own fate as the matter is intentionally forgotten for dodgy reasons. In a near lawless society like ours, I will not blame anyone and will not feel much if instant jungle justice is carried out on the real culprits that are caught red-handed as we likely know what will happen if the rule of law is followed. It is not the answer though, because it impacts negatively on the society in the long-term. I only hope that the police will wake up to their duties and work conscientiously. This world is full of wickedness,only God wil save us. This is so unfortunate. God ve mercy on us. Men are going crazier everyday. You tribalistic nicompoo! Was it not an ibo man who carried out the kidnapping?! Ewu Congo!!! Hey,not only Ogun state. Nigeria as a whole needs prayers.We v also heard about so many evil atrocities committed in the east. Thank God for destroying the plans of the enemy. Lucky boy. Thank God 4 him. Indeed God is workin 4 our favour n He is now exposing evil people. The boy was innoance n only God know's wht d boy when throught before he was recuse. God is not at sleep He's watchin over us. Evil people everywhere one turns to. You called someone else child inside your house and the next thing is to try end his life? For what? Quest for money these days is quite alarming. GOD will continue to expose all these blood sucking evil people in our midst. I hope the boy will be normal because toture affects one for a lifetime, especially psychologically. So, they should do what???. Leave the house so their partners will continue from where they stopped. Things like this makes me sick. What are we going to do ? Democracy / rituals. Nigerians should desist from jungle justice ,you are no differenct from the killers themselves if you take the law into your very own hands.That boy should be grateful to his friend for saving his life ,Very reason y as nigerians we av to look after our own. Burning down the house is totally ilegal n uncalled for ,All d evidence has been destroyed . U'd beta stop this blasphemy. Which one is "blood of God" again? Y won't they burn down the house? I thank God for the boy's life and salute the quick thinking if his friend as well as the gallantry of the residents. I pray the Police catch, try and get jailed all the perpetrators. Exactly my thought! Evidence gone! Oh well, na 9ja! Why is it dat Nigerians dnt use their heads. B4 acting.burning dwn d building is nt d nxt thing to do cos I believe there is more to dat evil den dey call a house. The culprits were the same who burnt the house. May the culprits be found and executed.